In mathematics, an identity is a statement true for all possible values of its variable or variables. The algebraic identity of x + 0 = x tells us that anything (x) added to zero equals the original "anything," no matter what value that "anything" (x) may be. 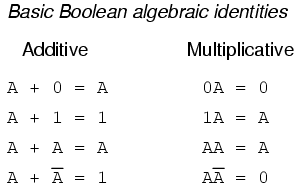 Like ordinary algebra, Boolean algebra has its own unique identities based on the bivalent states of Boolean variables. No matter what the value of A, the output will always be the same: when A=1, the output will also be 1; when A=0, the output will also be 0. No matter what the value of A, the sum of A and 1 will always be 1. 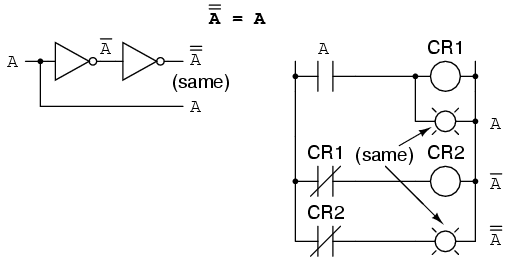 In a sense, the "1" signal overrides the effect of A on the logic circuit, leaving the output fixed at a logic level of 1. In real-number algebra, the sum of two identical variables is twice the original variable's value (x + x = 2x), but remember that there is no concept of "2" in the world of Boolean math, only 1 and 0, so we cannot say that A + A = 2A. Thus, when we add a Boolean quantity to itself, the sum is equal to the original quantity: 0 + 0 = 0, and 1 + 1 = 1.